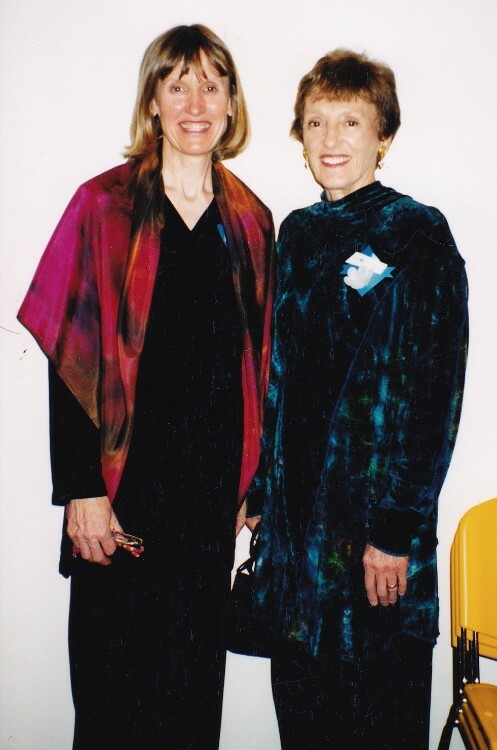 In Summer 2004, Textile Center honored Joan Mondale for all that she has given to the arts by dedicating its largest exhibition space to her, and the Textile Center Joan Mondale Gallery came into being. Joan has devoted her life to supporting artists and arts organizations locally, nationally, and internationally. She was an early and strong supporter of Textile Center, serving as honorary chair of our capital campaign, attending benefit after benefit, and encouraging everyone to support Textile Center. Earning the nickname Joan of Art, while her husband, Walter Mondale, was Vice President of the United States, Joan became one of the most effective, dedicated arts advocates in the country. Joan has pursued her love of art throughout her life as an artist, arts volunteer, and emissary. She has used her position in the political arena to focus public attention on art and encourage public and private support for the arts. Joan was instrumental in the development of both the Textile Center (now in its 20th year) and Northern Clay Center in Minnnesota. She has served on such boards as the Walker Art Center, Minnesota Orchestra, American Craft Council, Kennedy Center for Performing Arts, and National Portrait Gallery and was appointed chair of the Hiawatha Light Rail Transit Public Art & Design Committee. 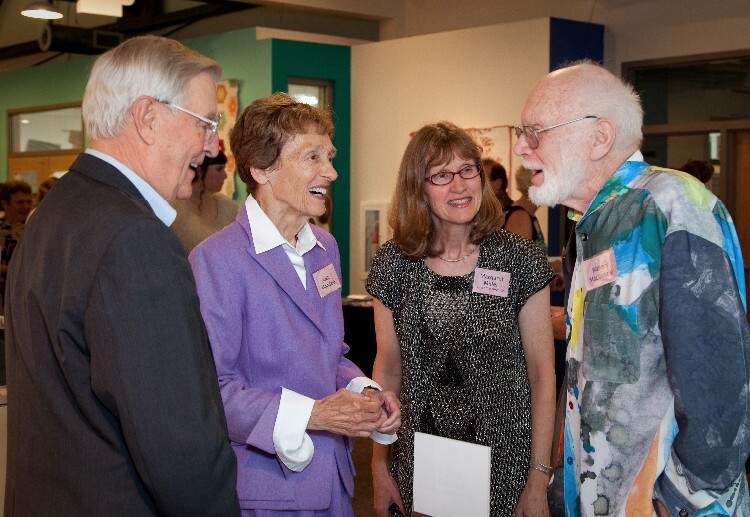 Textile Center’s Joan Mondale Gallery was the first permanent tribute to Joan. By naming the gallery after Joan Mondale, Textile Center honored her lifetime contributions to the arts as well as recognizing her efforts on behalf of Textile Center. With her help, Textile Center started an endowment for the gallery. The Mondale family continues to be involved and committed to Textile Center; William Mondale is a current member of the Board of Directors. Joan truly loved the arts and was always willing to offer her notoriety to support them. In 1998 she graciously accepted the request to be the Textile Center’s Honorary Chair of its capital campaign to purchase and rehab an old building that now serves as its facility, providing a beautiful home for fiber arts. At the grand opening in 2001 she was there to cut the ribbon and celebrate the $2,000,000 campaign. Her involvement was invaluable. In gratitude for all that she had done for the Center and the arts community, the Textile Center hatched a plan with her daughter Eleanor to name the Textile Center Gallery for her. The 2004 Joan Mondale Gallery dedication event was the first of a fundraising event series called Hot Art Cool Jazz and the featured band was the infamous New Standards led by Eleanor’s husband Chan Poling. Eleanor’s humor and energy made her the perfect emceed of the event that launched the Joan Monday Gallery Endowment, which has supported a decade of extraordinary textile exhibitions. With great eloquence and generosity, Joan’s son William stepped up to be our emcee at the following Hot Art Cool Jazz events and now serves on the Textile Center’s board. Joan’s unending support of the arts will be sorely missed but her legacy lives on through the institutions she has supported and her family who share her values and generosity. We will be forever grateful to Joan for all she has contributed to the arts. Joan Mondale passed away on Monday, February 3 at age 83. Our thoughts are with her family during this time. More about Joan and the planned service in celebration of her life can be found here and here.